Having the right cabinetry in the kitchen, bathroom and even garage is the key to having both an esthetically pleasing and functional space. Choosing the right cabinets for the house seems to be one of the most important decisions for many homeowners. Most people do cabinet remodeling on a budget, cutting corners wherever possible, and often opting for a mass produced cabinetry. Though the mass produced cabinets are similar in their quality to the custom cabinets, they tell little or nothing at all about the esthetic taste of the home owner. This is why whenever the budget is not an issue, people opt to install custom cabinets which not only reflect their taste but also fulfill any special needs that the homeowners or space requires, such as a curved wall. 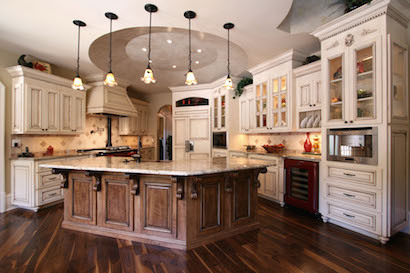 Custom cabinetry comes in as many shapes, styles and materials as a home owner can imagine. From the countertops, and finishing to the size and style, a homeowner can easily become overwhelmed with the number of decisions he has to make. As the choices are so varied, a home owner should always consult a professional in the field prior to creating any layout or design. After consulting with the professional, a detailed plan will be drawn, and a computer 3D presentation of the cabinets will be made. 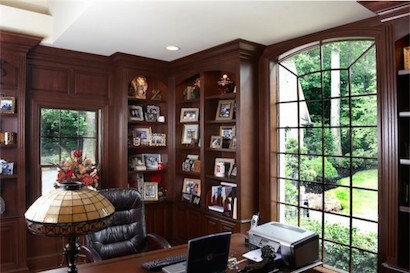 This will provide the homeowner with a clear idea of what the final result will look like. After the homeowner and the professional have agreed upon the style, measures and materials, the production of the cabinets will take place. The cabinets produced will reflect the company’s craftsmanship, the quality of wood used as well as their dexterity when it comes to applying the finish, as it is usually done manually. Hence why, it is important to use a company that specializes in custom cabinetry with a long record of satisfied customers and years of experience. After the cabinets have been finished, the installation of the same is done by a professional as well. The installation process is also important as if it’s not done right and by a professional, it can often result in damaging the walls as well as cabinets. Furthermore, the bad installation can lead to accidents, as any loose screws can cause the cabinets to fall off the walls. As a long-standing refinishing company, we have had a pleasure of working with hundreds of clients over the last two decades. Many of them have come with a completely unique set of problems that we had to find a solution for. This uniqueness and variety of problems we have faced in the last twenty years has awaken our creativity that today we can proudly say there is no cabinetry problem that we cannot solve. Thanks to our superb craftsmanship, laser sharp accuracy and the finest cabinetry wood, you can rest assured knowing that the cabinets made by Hollywood Refinishing will not only be esthetically pleasing and functional, but that they will also last you a lifetime.